Here's a great reproducible solution to the problem of how to deliver interesting and effective safety training outlines. This turnkey system gives you 50 safety training meetings on OSHA-required safety and general safety topics. So easy to use, you simply choose the topic, copy the number of handouts and quizzes you need, and hold your training session - it's that simple. 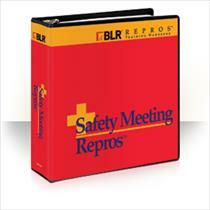 BLR's safety experts have done all the research for you with Safety Meeting Repros. It's a complete package with outlines, reproducible handouts, quizzes, lesson plans and recordkeeping forms.